Makes ~6-8x 16oz Grolsch bottles of kombucha. 1. Make sweet black tea: Fill your pot with ~3.25L of water and bring to a boil. Add your tea bags and sugar, and turn the heat down to simmer and dissolve the sugar. Once the sugar is dissolved, turn the burner off and let your tea steep and cool to room temperature. I typically leave mine overnight to cool. Pour your room temperature sweet tea into a large glass vessel containing ~2 cups of starter brew. Gently position your scoby back on top of the brew. (*If you don't have 2 cups of starter brew, you can use 2 cups of plain store-bought kombucha). Cover your brew with a light cloth and string to keep your brew safe from dust, etc. and place it in a warm-ish dark place to sit for 15-30 days. 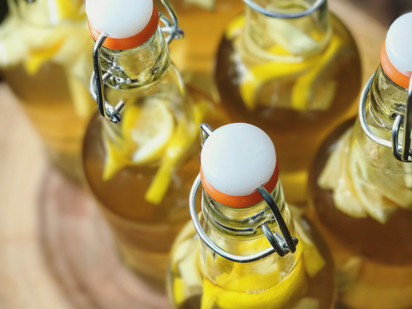 Taste-test your kombucha, using a baster or straw, every few days in that range to stop the fermentation when it reaches your desired level of 'tanginess'. (*The longer you ferment your kombucha, the less sweet and more tangy it will taste because the scoby has eaten up all the sugar. Fermentation is also more speedy at warmer temperatures). Note that a new scoby will start to form on top of your brewing kombucha (*see the picture below). Eventually, you will have multiple layers of scoby to share with others. Prepare 6-8 glass Grolsch bottles with your choice of flavourings. You can try lemon + ginger or cherry + almond extract as I have specified above. Siphon off your kombucha into the Grolsch bottles, leaving an inch or so of space at the top of the bottle neck. 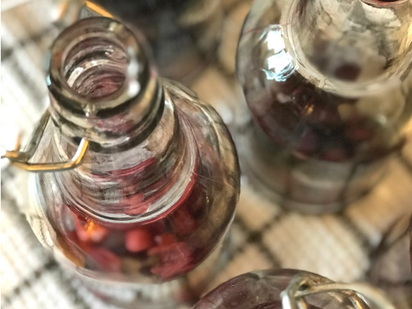 Cap your bottles and let them sit for ~6-7 days to ferment and bit longer and develop new flavours and light carbonation. Be gentle moving the bottles before opening them to prevent them from bubbling over. You can store your finished kombucha in the fridge for about one month. 4. 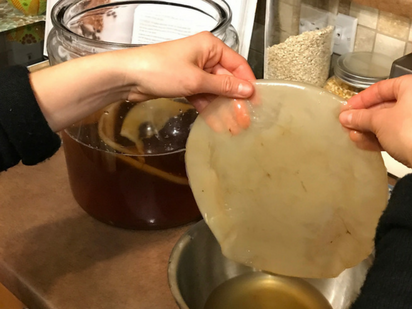 Monitoring the health of your scoby: Here is the link to a great resource to help monitor your living scoby. Brewing kombucha - first round of fermentation. New SCOBY forming on top. Chopped cherries and almond extract in Grolsch bottles ...awaiting to flavour my kombucha! Digestion: Fermented foods can be easier to digest because the process of fermentation breaks down ‘anti-nutrients’ (such as oxalates and phytic acids) and frees up more actual nutrients to be absorbed by your digestive tract. Vitamins: Bacteria and yeast can produce vitamins as they ferment foods - most commonly B-vitamins and vitamin K. So, essentially you could think of the fermented food as an enriched version of the fresh one. Probiotics: The bacteria found in fermented foods colonize your gut and improve your wellbeing. Not only do they promote digestive health, but they also affect your body’s immune system, mental health, sleep patterns, inflammation and metabolism. Aim to add one fermented, probiotic-rich food to your diet daily. Your guts will thanks you!